Out now from Princeton University Press. One of the reasons I was thrilled to publish this book with Princeton University Press was that they have been at the forefront of issuing Creative Commons versions of scholarly work. While many readers still prefer to have a physical copy of a book (I sure do!) others use or rely on electronic pdf versions. 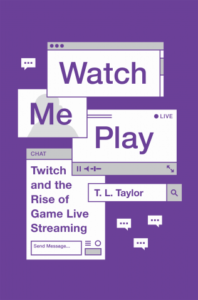 Given so much of this research for this project focused on the creative productions of live streamers who regularly share their work – for free – online, it felt even more apropos to have a free pdf of the book available. While you can still buy a physical copy of the book at Amazon, Princeton, or your local bookseller, if you’d like the pdf you can get it here.